RARE CHANCE TO SEE THE GETT TRILOGY IN ONE PROGRAM! Tuesday, Nov. 3, 4:00 p.m. – 10:30 p.m. AMC Northbrook Court. Hosted by Hadassah, ORT, Na’Amat and SHALVA. 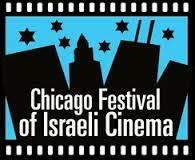 All films written and directed by siblings Ronit and Shlomi Elkabetz. With casts that include Israeli mega-stars Ronit Elkabetz, Simon Abkarian, Sasson Gabai, Menashe Noy, Yael Abecassis, Moshe Ivgy and Alon Aboutboul. In French, Hebrew and Arabic with English subtitles. 97 minutes. 2004. World premiere, Venice Film Festival. Before we hear her speak, we hear the voices of the men—Viviane Amsalem’s husband and relatives, “You must learn how to give up.” They tell this beleaguered hairdresser and mother of four that without marriage she has no worth, no future. And with a mesmerizing performance by Ronit Elkabetz, Viviane’s story unfolds as she desperately longs for a life where she might be fully visible and valued and loved. 103 minutes. 2008. Official selection, Jerusalem FF. Fast forward a decade—during the Gulf War. Viviane is separated from her husband Elisha. But the whole extended family has come together to sit shiva for one of Vivian’s brothers who died suddenly. As the shiva continues, family resentments bubble to the surface. 115 minutes. 2014. Ophir Award for Best Film. Golden Globe nomination. In Israel, a woman cannot get a gett (divorce decree) without her husband’s consent. Still separated and desperate to be released from her loveless marriage, we find Viviane embroiled in a 5-year dispute presided over by a panel of rabbis. The proceedings raise deep questions about love, marriage and personal rights as her husband stalls the process at every turn. Ronit Elkabetz (Viviane) stuns with her luminous, performance as she defends her dignity and fights for freedom. An award-winning Chicago film critic and journalist who now lives in New York, Jan has written for The Huffington Post, JUF News, World Jewish Digest, Reel Chicago and WomenArts. Her book, Penny’s Picks: 50 Movies by Women Filmmakers 2002-2011 is considered a must-read by movie buffs – regardless of gender. She is an outspoken advocate for women artists, particularly in cinema.